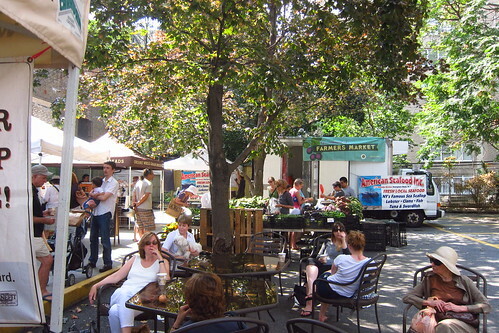 Like I mentioned on Monday, I'm smack-dab in the middle of collecting streams and streams of research on Manhattan's Greenmarkets. Today's rough, tomorrow's rougher, and if I make it to Saturday night, I'll be drunk, in the fetal position on my bed, crying hysterically, wondering why I signed up for this. (Answer: so we can have the necessary data to backup our arguments) I have already learned many things from the first 13 market visits, like who probably has the best peaches this week and a few new apple varieties are out this year. I always thought the true death knell to outdoor times is when the grapes arrive in October. Now I know the death knell to summer is the arrival of Ginger Golds. They're literally everywhere. But the new varietal you should seek out is The Honey Bunny from Prospect Hill Orchards. It's more tart than sweet, and crunchy, almost like a Braeburn. I've been eating them all week, and plan on picking up a few for some sort of dessert treat. 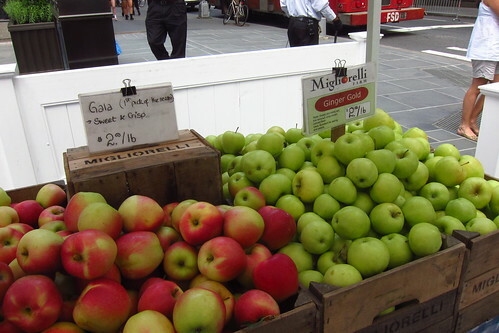 The orchard sells at the Tucker Square, Tribeca, Port Authority, and Ft. Washington markets. 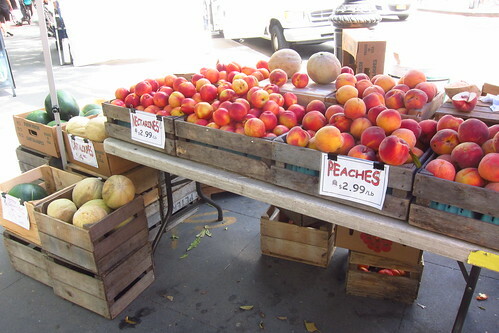 If you're looking to get in on the last of the peaches--I'm serious, the farmers keep saying to me that this is the last week for them--find a Toigo Orchards stand. They're not organic, but they do use Integrated Pest Management--it means few chemicals, and using environmentally sensitive ways of dealing with pests. Also, their peaches are freaking huge, juicy, sweet and altogether perfect right now! They're like peach candy. And so far the best market for Saturday morning lazing has been St. Stephens on the Upper East Side. It's small number of great stands means less of a crowd. Had I not just walked 50+ blocks, I would have sat and relaxed for a bit, maybe with a treat from nearby Two Little Red Hens. And another peach.